So you’re interested in buying laminate flooring but you’re unsure whether it’s the right choice of floor or you are wondering how to go about buying the right one for your room or simply want to know more about this wonderful flooring product before you decide. This buyer’s guide provides you with impartial advice answering your main questions and concerns before you buy laminate flooring by explaining the main what’s, where’s, why’s and how’s. To begin with you need to know exactly what it is you are buying. The first question that comes to mind is what is laminate flooring made from? Is it wood? Well yes but it’s not throughout solid wood. Laminate flooring is the most innovative creation for floors and It ’s comprised of several layers of particle fibre wood known as HDF pressed together using a lamination process with a top and bottom layers. These layers may be off cuts or recycled leftovers from wood materials claiming to be eco aware to an extent unlike solid wood flooring that uses single blocks of natural wood whereas laminate flooring uses wood particles fused together with resin. But don’t be put off by this because on the surface, it’s a whole different look and finish. Even though laminate is made up of reconstructed wood, it can very well resemble solid wood. The upper layer of this synthetic flooring is designed to mimic natural wood using a printed “photographic” layer, known as the design layer, and a clear top wear layer that protects it from scratches and damage. Laminate flooring is a product with endless possibilities and you can find practically any design you desire. Laminate flooring can be installed in almost every room of your home. You’ll sometimes even find it in commercial properties too since it is so highly durable given the correct AC rating. One of the big advantages of laminate flooring is that most manufacturers design it to be an “install anywhere” kind of product. 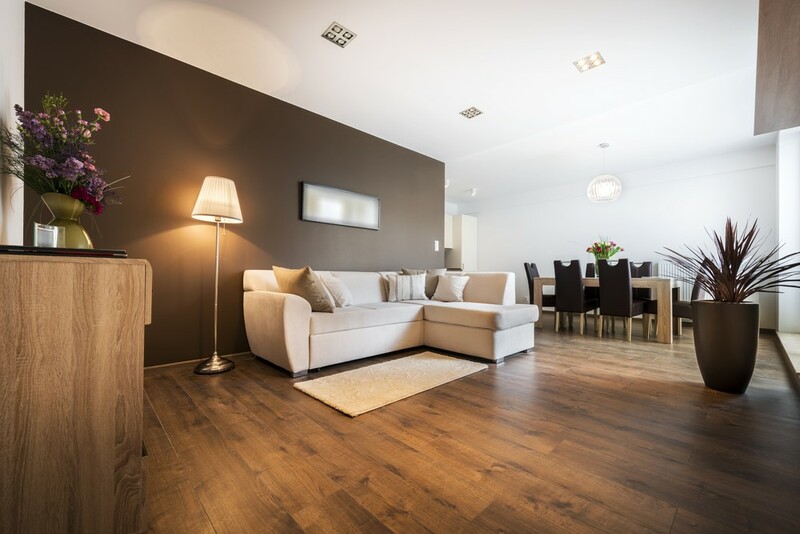 For those with a busy family home, including pets and children running around and making a mess, laminate floor is ideal for those high traffic areas. 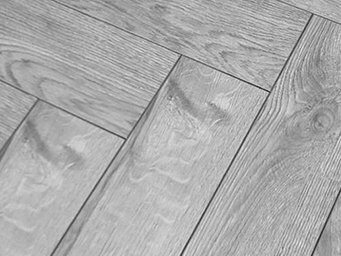 It is the most highly recommended flooring type for kitchens, bedrooms and living areas as it is easy to wipe clean, can be quickly installed, fits any style of décor, and it doesn’t necessarily need a subfloor – although a top tip is to install an underlay as it can be valuable for a quieter and more insulated floor. The only areas that aren’t recommended for laminate flooring are particularly humid environments such as wet rooms, saunas and some busy laundry rooms. Due to the many layers that make up laminate flooring, having water seeping into the materials can cause it to warp and split. If you are looking to install laminate flooring in the bathroom then ensure you have sealed the shower cubicle, sink and toilet surrounds with water proof sealants and its always a good idea to place a mat around areas where you tend to get regular seeping of water such as showers and sinks. People are often torn between choosing laminate flooring, real wood floor or vinyl tiles. While there are similarities between them, it’s laminate flooring that pulls above the rest. It is a family friendly type of flooring, being easy to clean and maintain with a simple brush down or vacuum; if you’ve had spillages or muddy feet tracked across it, a damp mop or cloth can be used to keep it clean. On top of that, laminate flooring is excellent value for money being far cheaper than the real wood flooring that it imitates and is much easier to install. If you don’t want to hire a professional, you don’t need to thanks to the quick click system which allows panels to be snapped into place and it doesn’t require a sub floor. Laminate flooring is available in different levels of durability rated using an AC score on a scale of AC1 to AC5. Generally laminate floor is said to have a lifetime of up to 10 years, but if you choose the correct level of durability, your flooring could last you far longer since it is very resistant to damage and scratches due to the clear protective wear layer that sits on top of the photographic layer. For a family home, it’s recommended to purchase laminate flooring between AC1 and AC3. The lowest level of durability is AC1, and it’s often the cheapest too. This is ideal for rooms that get very little wear and tear such as guest bedrooms or formal living areas. AC2 rated laminates are better for rooms that are used more frequently such as bedrooms; and AC3 floorings are best for high traffic areas that are likely to have more wear and tear including hallways, kitchens and bathrooms. The final thing to take into consideration is what style of flooring you like and how it will look in your room considering the surround décor and theme. Laminate flooring comes in many different styles and colours. You have the option to imitate natural woodgrains that come in different variations making it a good choice to match many different interior styles, from shabby chic and rustic to sophisticated and traditional. If you already have plenty of furniture or an established interior décor theme, then you can go for neutral and minimalist laminate flooring colour and style that will have a less of a contrast and bring your existing décor into focus. The life span of your laminate flooring may also depend on trends. If you have a keen eye for interiors and like to keep up with the latest fashions, you may feel like changing your flooring more frequently than the recommended 10 years. Fortunately, since laminate flooring is affordable such good value for money and is quick and easy to install, this often doesn’t present a problem. The first thing to consider when shopping for any kind of flooring is what your budget will be. While, of course, everyone loves a bargain, finding the cheapest laminate flooring possible isn’t always going to be the best decision. The quality of your flooring is often reflected in the price you pay. Sourcing laminate flooring that is far below the usual high street prices means that you’re often going to get something that’s far poorer quality than you expect. Compromising on the quality of your floor, something that you walk on and see every single day, isn’t worth it to save a few pennies. The pricing of laminate flooring will depend on the style you’re looking at and the durability. It’s likely that a cheaper flooring will get damaged more quickly or won’t fit your needs, so make sure that your budget is sensible when looking for laminate. If you’re looking forcheap laminate flooring that’s good quality and value for money, then you’re not too far away.